Last weekend I had wonderful experience of walking for the March of Dimes with the Boston Mamas team. We raised over $7600 and I beat my personal goal of raising $500. Thank you to all who donated to help moms to have healthy, full-term pregnancies. One of the most touching and emotional part of the event is the Luminaria Ceremony. As the sun sets over campsites and darkness falls, the night is brightened by the glow of illuminated bags called luminaria, each bearing the name of someone who has battled cancer. Some celebrate cancer survivors, while others help us honor and remember those gone too soon. I have a luminaria for my father who died of brain cancer in 2005 and plan to walk the luminaria lap. Since this event is 18 hours long, I also signed up to walk for two hours in the middle of the night. If you'd like to donate, please visit my Relay for Life page. 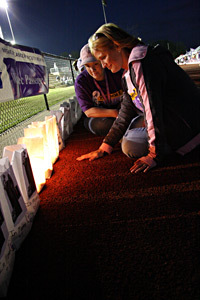 You can also honor or remember someone with a luminaria during the Relay For Life Luminaria Ceremony. No donation is too small, please help. Thank you!